I may or may not have flailed tremendously when I got my hands on an ARC of Mortal Heart at BEA this year, not going to lie. It was definitely a book I was majorly anticipating after I binge read Grave Mercy and Dark Triumph earlier this year! But amidst my excitement, there was certainly a thread of doubt. Would I be able to love Annith as fiercely and passionately as I loved Sybella or Ismae? I should never have doubted Robin LaFevers. She is brilliant. Mortal Heart, Annith’s tale, was captivating! Even now, I’m still very much in awe of how well-written this is. I find it extremely impressive that LaFevers was able to write this novel so well. It cleverly tells readers about who Annith is, while still juggling the plots of war, assassin nuns & court life that carries over in each novel. While Sybella is still my favorite of the three girls, my love, admiration and respect for Annith grew in leaps and bounds as I read Mortal Heart. She proved herself to be so much more than I expected from her. But what I loved most is that many aspects of her personal journey – the doubt, the fear, and the hope – are easy to relate to emotionally. Her story left me awestruck and heartbroken in equal measures. Annith certainly plays a role in the bigger picture (in terms of her country of Brittany), but it’s really her own journey of self-discovery that carries Mortal Heart along so well. Time and again, Annith faces obstacles (in the form of people or events) that threaten to block her path. But each time, Annith manages to find a way through (or around) them! Her persistence is rewarded as we learn more about her history and abilities, and also (very subtly), learn to love her as she is. But this novel is not just about the romance. Nor is it simply about Annith’s personal experience. No, Mortal Heart also still touches on the political situation surrounding Brittany & France. As the court of Brittany find themselves running out of time and manpower, it is up to Annith, Ismae & Sybella to play their parts the best they can to win the best possible victory for Brittany. It’s a twisted plot, with plenty of subterfuge to boot, but it works really well. I didn’t know how LaFever would choose to end this particular plot, but the way it does happen felt right. Honestly, Mortal Heart blew me away. It also brought me to tears, as I cried way more than one time as I read this story. There’s no way that I could have imagined such a wonderful, fitting conclusion to the His Fair Assassin series. LaFevers wrote a series ender that felt right and did proper justice to this story and these characters. While I’m sad to close the covers on these books (for now), I’m also happy that the series was strong from start to finish. If you enjoy historical fantasy, then you should totally consider picking up a copy of Grave Mercy and reading it! Wow, thanks for the thorough review of this book!! 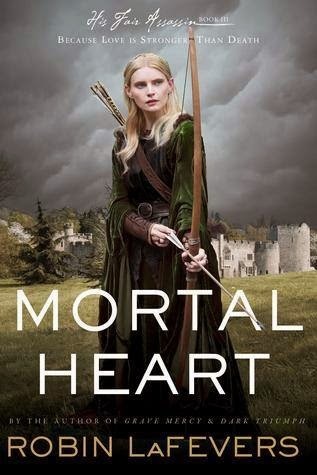 I've read both Grave Mercy and Dark Triumph by Robin LaFevers earlier this year and look forward to reading Mortal Heart. Keep writing great reviews!! Oh I'm so glad you enjoyed this!! :D I've heard nothing but amazing things about this conclusion. Wonderful review ! So so so excited about this one while at the same time kinda scared to read it. I don't know how I feel about this series ending! Very glad that it was so good and you loved it! Lovely review, Alexa! I couldn't agree more. I loved Annith's journey and found it unexpected and moving. Her strength of character was wonderful to witness. And, yes, the love interest is super swoony. <333 I'm sad this series is over but I can't wait to see what RL will have next.